This advert was used in a 2000 campaign by Midlands based energy company nPower. The campaign caused hundreds of complaints to the Advertising Standards Authority (A.S.A). 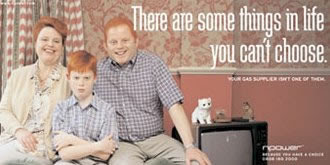 The Advertising Standards Authority is considering criticism of an advert for npower featuring a ginger-haired family beside the slogan: "There are some things in life you can't choose". A spokesman for the company said it had not meant to offend redheads, but was merely trying to use humour to show that people could change their gas supplier. I'm generally pretty easy going about jokes and insults towards red-heads, but this actually really pissed me off. The ad itself made me smile, but the fact that people made legitimate complaints and had them ignored because it's "light-hearted humour" is total crap. I have reddish hair and have had all the jokes and years of bad stuff thrown my way, but for NPower (U.K.) to try to sway this off with, "it was just a joke", shows just how completely stupid they are - AND how gullable they presume all of us are. I wouldn't hurt the company, as there are a lot of workers who knew nothing of this advert being approved (8,500 employees)- but the final say comes to the president of the company. He/she has the last word on saying 'yes' or 'no' to the advertisement. (that's why there are so many horrible commercials). Find out who the ceo of NPower was at that time (year 2000)(president is different now) and place a LOT of ... feces (some idea) in his car, food & office. (Over a long period of time.) He should know that he is a hunted/marked man. *Now, to some, that may sound a bit angry (can you blame it?) or even immature - but think about this 'joke' that he is getting away with. What if they put a black family up there (just another colour). Or a Jewish 'looking' family. (Just another stereo type). He would have been put in jail. But because this is just 02% (or less) of the entire planet he figures, "Yeah, I can get away with it- hee hee." (place greedy/sinister george bu$ch jr. laugh here). Looking at NPowers biography on their web page, they deleted any news about their ads in 2000. (let's just call them fox news, only in England).